Fresh and trendy, the Dahlia paris a caviar black floral print on the outside with a gorgeous mint green lining for a flirty yet sophisticated look. Features diamond quilting and pewter hardware. Dahlia Hobo, part of the Bella Taylor line by VHC Brands. Dahlia Metro Crossbody, part of the Bella Taylor line by VHC Brands. Dahlia Signature Zip Wallet, part of the Bella Taylor line by VHC Brands. 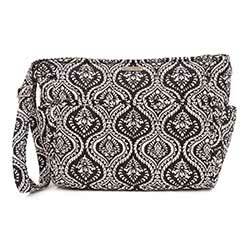 Dahlia Wristlet Pouch, part of the Bella Taylor line by VHC Brands.